Bruschetta is a popular antipasto or appetizer served around the world. It is commonly found in Italian restaurants or pizza parlors. There are many different types of bruschetta toppings; however, no matter the variety, the toppings are always served on a single piece of toasted or grilled bread. Some people insist that bruschetta must be topped with olive oil, though others believe the toppings can vary. The cooking and consumption of bruschetta can be traced back to the 15th century, when it originated in Italy's Tuscany region. The Italian translation of bruschetta is “to roast over coals.” This refers to roasting the bread, not the toppings. Bread that was going stale was sometimes salvaged by turning it into bruschetta. Bruschetta was originally composed of grilled bread, olive oil, garlic, salt and pepper. It was a common way for olive oil producers to showcase their product. The use of tomatoes and other ingredients is more recent. It became a popular appetizer or antipasto in the United States in the 1990s. Bruschetta is traditionally made from toasted or grilled Italian white bread. The bread is cut thinly. However, the bread shouldn’t be so thin that it becomes soggy from the olive oil or toppings. Traditional toppings include olive oil, garlic, basil, tomatoes, salt and pepper. The garlic can either be chopped onto the bread or rubbed into the bread. The tomatoes are usually diced and mixed with the basil, salt and pepper before adding to the top of the bread. There are hundreds of different versions of bruschetta in restaurants around the world. 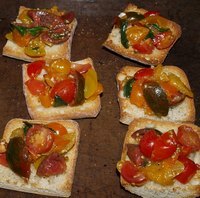 Though some argue that it is not truly bruschetta unless the toasted bread is topped with olive oil, many people have substituted the original ingredients. In fact, in many recipes, the toasted piece of bread is the only remaining ingredient from the traditional recipe. Bruschetta topped with sauce, cheese or vinaigrette instead of olive oil is common. Many people add mushrooms, artichokes, olives, onions and other vegetables to the topping. There are even egg salad bruschetta and dessert bruschetta topped with honey and fruit. When making traditional bruschetta, Tuscan ingredients should be used, especially Tuscan bread. The bread is round or oval in shape, white in color and airy in texture. When baked, the bread's crust is brown and very flaky. The bread also tastes mildly of almonds. Bruschetta, though made of similar toppings, is not a small pizza. The bread is usually toasted or grilled before the toppings are added. Pizza is traditionally baked together with its toppings.